Ball lenses are used for various tasks such as improving the coupling between optical fibers and the emitters or detectors they interface with. They are also used in endoscopy, bar code scanning, ball pre-forms for Aspheric lenses and sensor applications. 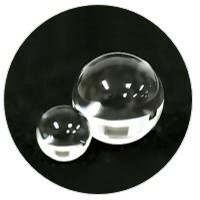 Ball lenses are manufactured from a single substrate of glass and can focus or collimate light, depending upon the geometry of the input source. Half-Ball lenses are also common and can be interchanged with (full) Ball lenses if the physical constraints of an application require a more compact design. There are five key parameters needed to understand and use ball lenses : Diameter of Input Source , Diameter of Ball Lens , Effective Focal Length of Ball Lens , Back Focal Length of Ball Lens and Index of Refraction of Ball Lens.